I was thinking I'd try adding layers of organza until it wouldn't fit under the sewing machine foot, but I think this one is done, so I'll have to save that experiment for a different piece. 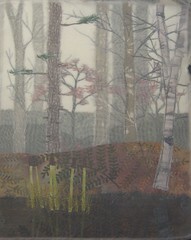 I really like the way the organza implies the depth of the mist, and distance from the viewer. While I am not completely sure about the top layer of silk, over everything, I like it better with than without. I feel like I am developing a vocabulary for water and trees and sky. Silk is perfect for water and sky - it has a kind of glow that few other fibers do, it takes color well, and (in utter woo-woo terms) the organic nature of the fiber shows through. Cotton and wool are my preferred materials for land and objects. They look more opaque, more solid and grounded. A very good thing for trees.